The Flat Earth Society primarily concerns itself with the known Earth - the area which the light from the sun affects. 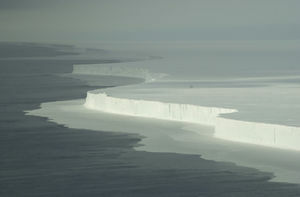 Along the edge of our local area exists a massive 150 foot Ice Wall. The 150 foot Ice Wall is on the coast of Antarctica. The Ice Wall is a massive wall of ice that surrounds Antarctica. The shelf of ice is several hundred meters thick. This nearly vertical ice front to the open sea is more than 50 meters high above the water's surface. "It was ... an obstruction of such character as to leave no doubt in my mind as to our future proceedings, for we might as well sail through the cliffs of Dover as to penetrate such a mass. It would be impossible to conceive a more solid-looking mass of ice; not the smallest appearance of any rent or fissure could we discover throughout its whole extent, and the intensely bright sky beyond it but too plainly indicated the great distance to which it reached southward." Sir James Clark Ross and his expeditionary fleet sailed around the Ice Wall for a number of months in circumnavigation. Between pit stops at the Cape of Good Hope and his polar expeditions, he spent the next several years of his life circumnavigating the southern coast vainly in search of a south sea passage to the other side. Beyond the 150 foot Ice Wall is anyone's guess. How far the ice extends; how it terminates; and what exists beyond it, are questions to which no present human experience can reply. All we at present know is, that snow and hail, howling winds, and indescribable storms and hurricanes prevail; and that in every direction "human ingress is barred by unsealed escarpments of perpetual ice," extending farther than eye or telescope can penetrate, and becoming lost in gloom and darkness. Some hold that the tundra of ice and snow stretches forever eternally. The Ice Wall is a natural formation, a thick mass of floating ice that is attached to land, formed from and fed by tongues of glaciers extending outward from deep within the uncharted tundra into sheltered waters. Where there are no strong currents, the ice becomes partly grounded on the sea bottom and attaches itself to rocks and islands. The wall is pushed forward into the sea by glacial pressure until its forward growth is terminated. The entire coast of the Ice Wall is not one single complete wall, however. There are actually a series of thousand mile long walls, divided by Transantarctic Mountain Ranges up to 11,500 feet high. The weight of The Ice Walls are so enormous that they have literally pressed the land two thirds of a mile (one kilometer) into the earth. Under the massive forces of their own weight, the ice walls deform and drag themselves outward. Very large glaciers called ice streams flow through them continually, transporting ice from deep inland out to the sea. Temperatures are thought to approach absolute zero the further one explores outwards. Exploration in this type of pitch black freezing environment is impossible for any man or machine. We live on a vast plane with an unknown diameter and an unknown depth. Dr. Samuel Birley Rowbotham held that knowing the true dimensions of the earth may be something that is forever unknowable by man. Source: Drewry, D. J., ed. (1983). Antarctica: Glaciological and Geophysical Folio. Scott Polar Research Institute, University of Cambridge. ISBN 0901021040. Description: "A brilliant expose of how Antarctica is sealed off from the rest of the world by 'red tape'. Ben, Taboo Conspiracy, takes us on a guided tour through the rules, regulations, and red tape that make exploration of Antarctica virtually impossible for anyone." This page was last modified on 8 April 2019, at 08:52.